Every director wants to push the the bar higher in one way or another or open peoples minds to new ways of making a movie. Where most directors at the moment are favoring CGI for major scenes Zack Snyder has been busy building massive outdoor set with scenes of destruction which could almost be confused with modern works of art. 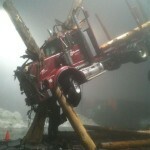 The latest on set pictures show how a truck can get impaled on a telegraph pole. This goes with the pictures we saw a few months ago of Smallville being trashed. If this is what Superman gets up to in Smallville I can’t imagine what Metroplois will look like the action kicks off in the biggest movie of 2013 which can’t come soon enough. Thanks to the Facebook fan page for the picture.